Hello and Happy 2018! Tina Walker here today to welcome you to a new Year and to share my first post of 2018. During the holidays, it is hard to find time to create. 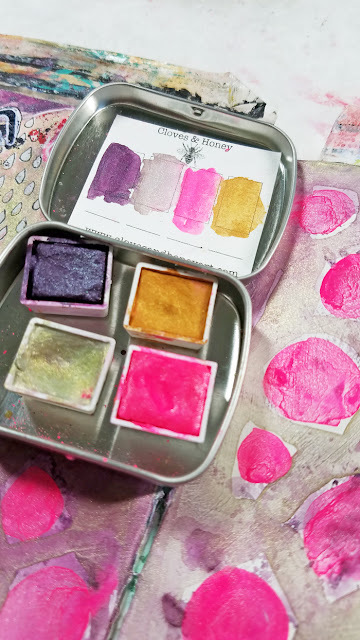 When I feel the need to create and I have limited time, my go-to project is my art journal. 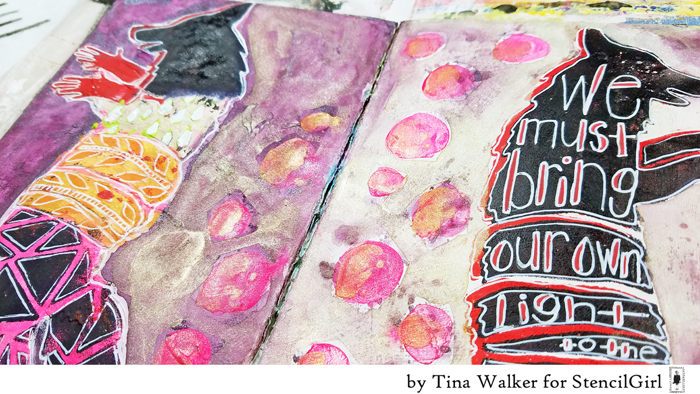 For me, art journaling is way to experiment and play, without the pressure of a completing a project or piece. 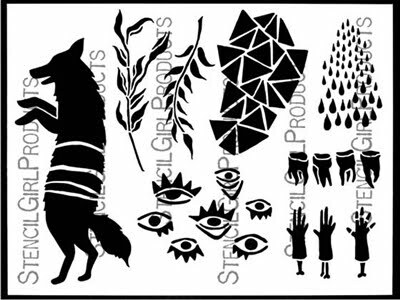 StencilGirl stencils have long been the first thing I grab when I have a few minutes to create. They create instant areas for journaling, are great for fast backgrounds, and give you a place to kick start your creative adventure. When I get in these creative bursts, it is easy to use a stencil in the same orientation and way. A simple way to expand the creative options, is to simply flip the stencil horizontally. Keeping this mind, I created an art journal page using both shapes to reflect opposites. Good/Bad, Right/Wrong, etc. In 2 seconds, I just doubled the use of one stencil. Now think how many possibilities exist when you rotate and vertically flip a stencil! Endless. My background was created using watercolors. Watercolors make quick and colorful backgrounds without much effort. For the stenciled image on the right of my spread, I used a 'double exposure' type of effect. Stencil the image with one color of paint and dry. Move your stencil slightly to the right or left and apply another color of paint. Easy Peasy. 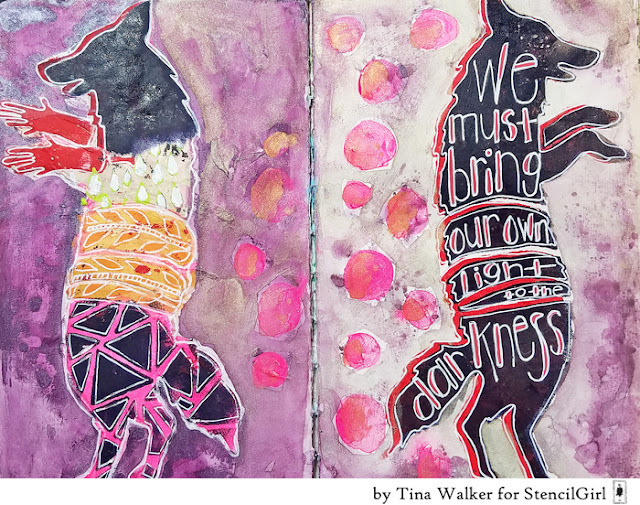 I used the instant shapes created by the stenciled shape for my journaling. For the stenciled image on the left page of my spread, I flipped the stencil horizontally and applied a layer of paint. For a different look, stencil other images (of the same stencil) inside the main stenciled image. I call this a 'stencil within a stencil'. In addition, I had stenciled the same colors as the right image on a sheet of rice paper. I cut out the head and hands of the image and adhered it on the left image. For me, it reflected the continual battle we all face between good and bad, and right and wrong. Some quick outlining with a white pen and my page was done. Not complicated or over-thought. Exactly what I had time for. Thanks for stopping by! Have a wonderful day.